الولاية الأمريكية إحدى الكيانات الوطنية ال50 المكونة للولايات المتحدة الأمريكية والتي تتقاسم السيادة مع الحكومة الفدرالية (هناك أربع ولايات تستخدم لقب المناطق الاتحادية بدلا من ولاية). 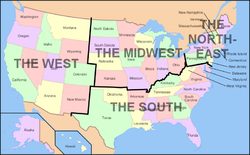 The West, The Midwest, The South and The Northeast. 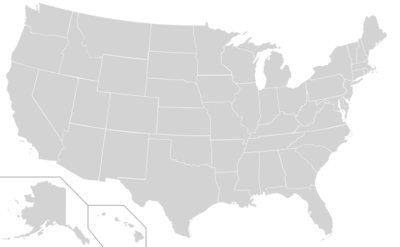 Note that Alaska and Hawaii are shown at different scales, and that the Aleutian Islands and the uninhabited Northwestern Hawaiian Islands are omitted from this map. ^ The Hartford-West Hartford-Willimantic Combined Statistical Area is the most populous metropolitan area in Connecticut. ^ The Miami-Fort Lauderdale-Miami Beach Metropolitan Statistical Area is the most populous metropolitan area in فلوريدا. ^ Baltimore City and the 12 مريلاند counties of the Washington-Baltimore-Northern Virginia Combined Statistical Area form the most populous metropolitan region in Maryland. ^ The City of Saint Louis and the 8 Missouri counties of the St. Louis-St. Charles-Farmington Combined Statistical Area form the most populous metropolitan region in Missouri. ^ The 5 southeastern نيو هامپشر counties of the Boston-Worcester-Manchester Combined Statistical Area form the most populous metropolitan region in New Hampshire. ^ The 13 northern نيوجرزي counties of the New York-Newark-Bridgeport Combined Statistical Area form the most populous metropolitan region in New Jersey. ^ مدينة نيويورك is the most populous city in the United States. ^ The Cleveland-Akron-Elyria Combined Statistical Area is the most populous metropolitan area in Ohio. ^ The Greenville-Spartanburg-Anderson Combined Statistical Area is the most populous metropolitan area in South Carolina. ^ The Nashville-Davidson-Murfreesboro-Columbia Combined Statistical Area is the most populous metropolitan area in تنسي. ^ The Dallas-Fort Worth Combined Statistical Area is the most populous metropolitan area in Texas. ^ The 10 ڤرجينيا counties and 6 Virginia cities of the Washington-Baltimore-Northern Virginia Combined Statistical Area form the most populous metropolitan region in Virginia.